Immediately after Our Lord sweat blood in the Garden of Olives, he found his disciples sleeping and admonished them to pray, that they would not fall into temptation. The next moment Judas kissed Him in betrayal (Luke 22: 44-48). This trilogy – blood, temptation and betrayal – is still with us after two thousand years. "Several years ago, there was a Catholic family of seven brought before the ruling Islamic authorities in Sudan. Their crime: the practice of the Catholic Faith. They were ordered to convert to Islam or be executed. They refused and were executed one by one. Upon orders to convert, each martyr began reciting the Apostles Creed and was shot. The father went first, followed by each of his children, each following the same pattern. Ordered to convert, they simply began to say the Apostle's Creed and were shot for their ‘crime’ against the Islamic State. (1) "Mr. Tuttle responds to Fr. Brian Harrison," The Remnant, July 31, 2001 p. 1. Truly this kiss, by the Supreme Pontiff at the Vatican in May 1999, betrayed Our Lord and the Church He founded. 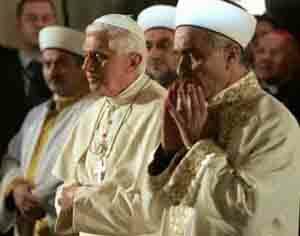 In Turkey on November 30th, 2006, Pope Benedict XVI entered the Blue Mosque, barefoot, and turned to Mecca with the Muslim muftis in prayer. By this act a spiritual kiss of betrayal was given to the same Lord as Judas and JPII after him. Real Blood spilled from Our Savior's body in the garden while his disciples slept, followed by the kiss of betrayal and the Crucifixion, with a small remnant being with Our Lord as He suffered. 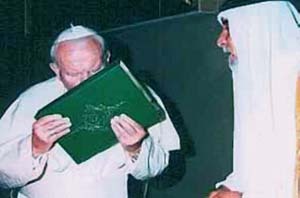 Real blood spilled from the martyred bodies of the Catholic family in Sudan while in betrayal the Pope kissed the Koran. The Vatican II people of God were apparently enjoying their sleep after the betrayal, and only a remnant reacted with vigor to the suffering Church. When Benedict XVI performed his spiritual kiss at the mosque, everyone was awake. The people of God have become so comfortable with the New Church that their hearts no longer beat with outrage, and the word "betrayal" is no longer part of their repertory. But there was a time when the Church Militant fought its enemies. 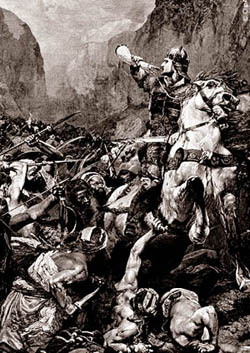 Count Roland, who fought the Moslems with his band of heroes (instead of joining them), spilled his own blood. His Olifant, and blows with all his might. He's burst the veins of his temples outright. Quoth Charles: `I hear the horn of Roland's cry! He'd never sound it but in the thick of fight" (The Song of Roland). We of the remnant are in the thick of fight, and shed our spiritual blood, lest we fall into temptation. Today even secular America wages war against the followers of Mahomet, while Popes and the Vatican II people of God seem to ruminate as they kiss the bloody hands of the enemy. With pains of anguish the winds of the remnant's Olifant are calling others to the fight. Hear us oh thee of the Mystical Body, you can resuscitate the Church Militant by seeing the enemy within! Rush to our aid as did King Charles and Duke Naimon and all the French. Don't let the Conciliar Church crush the remnant as happened at the Vendée. Hear the call and join us of the new army of Vendée. The ‘constitutional’ priests of the Conciliar Church have sworn an oath to Vatican II, a re-run of those swearing an oath to the 18th century Revolutionary Constitution of France that sought to destroy the Church and Christian Civilization. Resist to the face this betrayal of the Faith and ask without fear, "Quo, Vadis, Petre?" Yes, Crisis in the Church!